Between Houston and Galveston, the five communities of the Interstate-45 Corridor offer a smaller, quainter approach to Southeast Texas living than the bustling city centers nearby. 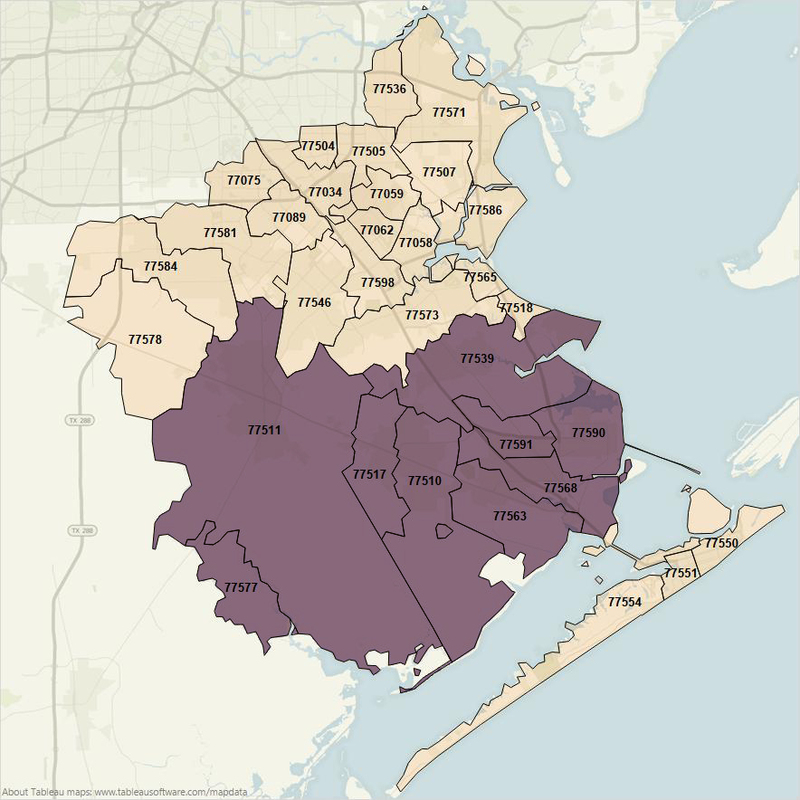 Dickinson, Santa Fe, Texas City, La Marque and Hitchcock each have their own unique appeal, but all of these small, tight-knit communities take full advantage of the Galveston Bay Area as a great place to live, raise a family and be part of a community. These great American towns offer something to meet every lifestyle and interest, from a rural feel and country life in Santa Fe, to the coastal fishing village ambiance of some of the communities along the bay, to traditional homes and neighborhoods. Yet, none of these communities are more than a few minutes’ drive from a major highway, easy access to UTMB facilities, to the island and UTMB’s main campus, or to Houston and all that it offers. In Hitchcock, just a few miles north of Galveston Island and on the west side of the Bay, the Harborwalk community fuses the majestic beauty of the natural wetlands with the amenities of a master-planned neighborhood, including a stunning marina and club. To the east, the Texas City Dike extends nearly five miles into the open waters of Galveston Bay and is a common destination for boaters, fisherman, nature lovers, sailors or those who wish to watch shipping traffic as it motors past. Dickinson is famous for its towering pine trees and a new state-of the-art school sports center and stadium. Places like the Nessler Park Family Aquatic Center, with water slides, a lazy river and large children’s play area, cater to local families who want to beat the Texas heat in the warmer months of the year. These towns all feature great places to eat, numerous parks, sports fields and courts, bayous, hiking and biking trails, and vibrant community events and festivals. The local county fairground hosts an annual fair and rodeo that draws visitors and competitors from afar, and surprises—like a thriving winery, wilderness park/zoo, golf courses and farmers’ markets—keep life in the region interesting. These communities are perfectly tailored to meet the needs of residents and families seeking the safety and charm of a small town, while still near to all that is offered by nearby Houston and Galveston. Dickinson Independent School District offers an exceptional educational experience for students grades K-12 and fabulous facilities with the latest technology. The district includes six elementary schools, two middle schools, one jr. high and one high school. Dickinson is part of the North Galveston County Chamber of Commerce and is conveniently located between the Houston metropolitan area and the beaches of Galveston Island. Dickinson is nestled in green foliage, tall pine trees and winding waterways great for fishing and boating. The mission of the Santa Fe ISD is to prepare all members of the learning community to achieve and succeed through innovative strategies and collaborative relationships. SFISD spans 72 square miles and encompasses the cities of Santa Fe, parts of League City, Dickinson, LaMarque and Hitchcock. Santa Fe ISD retains a rural flavor while having big city amenities and opportunities close at hand for students. The 4-A district serves approximately 4,600 students and is growing at a slow, consistent rate. Texas City ISD has 14 schools and nearly 9,000 students in 78.31 square miles of La Marque and Texas City. Throughout the years, TCISD has received numerous academic commendations from the Texas Education Agency, including exemplary and recognized schools. Featuring one elementary school, one middle school and one high school, HISD has won the Leadership Circle Award from the Texas Comptroller for the fourth year and recently opened a brand new high school campus in March of 2013 to better accommodate the students of the Hitchcock area. The great American towns of Galveston County offer a wide variety of homes and housing choices, from rural enclaves and country life, to the coastal fishing village ambiance of some of the communities along the bay, to traditional homes and neighborhoods. Check the resources below for current information, including current listings for home sales and rentals, for this region. Please read our disclaimer about the links below, and visit our links page for additional information and tools related to relocation.